DIRECTIONS: Remove protective film. Then place the unit visibly anywhere in the aquarium or filter. 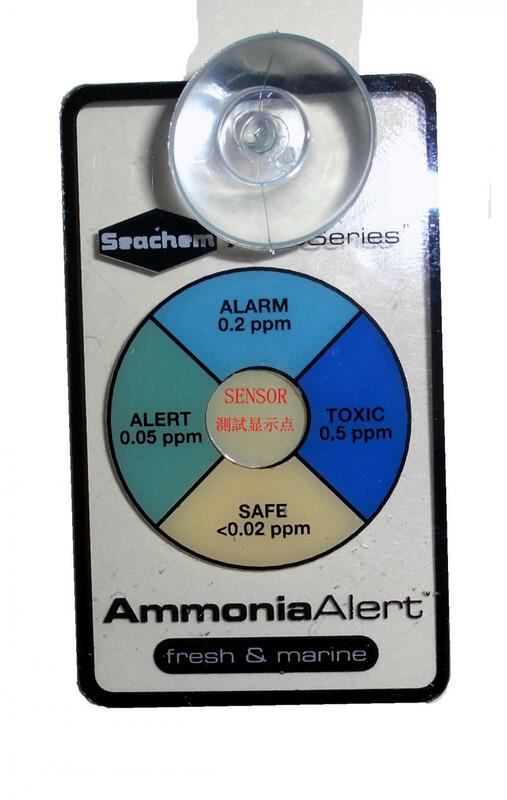 The sensor, located in the center of the reference scale, changes reversibly from yellow to green to blue relative to the ammonia concentration. Response to decreasing ammonia is slower, requiring about 4 hours to go from TOXIC to SAFE on removal of ammonia. Note: Avoid touching the sensor with fingers, since skin oils can damage it. DO NOT use bleach, soap, detergents or hard objects to clean the sensor. 1)黃色(等同下面) ------------ <0.02 安全 可以放养到最大容量.